Do you currently use Practice Management software? Medical practice management software is designed to streamline clinical workflows, automate billing, assist with claims management, lower overhead, and increase the overall efficiency of day-to-day operations in a hospital, ambulatory clinic, or office. Many of the best medical software providers offer this as just one facet of their overall solution. Sometimes called a practice management systems (PMS), medical information system (MIS), or hospital information system (HIS), practice management software is an integral part of medical practice today. While all of the best practice management software platforms should include functions for claims management, medical billing, and financial reporting, there are important considerations concerning additional functionality, integration with other software systems, input interfaces, and specialty-specific needs. This guide will help prospective buyers consider all options when purchasing a practice management system. 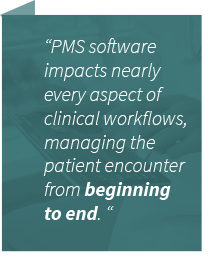 Practice management software impacts nearly every aspect of clinical workflows, managing the patient encounter from beginning to end. To pinpoint the best medical practice management software, one must take into consideration the following features. When patients make a new appointment, the scheduling information is entered into the PMS, which maintains the master office schedule. Some programs include a patient portal, which allow patients to schedule their own appointments online. In addition, some also automate the appointment reminders process, either via an auto-dialer that uses pre-recorded voice or via email. The software also serves as the repository for all patient demographic information, including insurance eligibility, appointment history, medication lists, medical history, etc. Some practice management systems support pre-registration, allowing patients to enter their information via the patient portal in advance of the appointment; others utilize tablets or scanned paper forms to input this information for in-office registration. Some practice management software allows visual resource planning. The software manages which patients go to what exam room and when, and then also notifies nurses or physicians that the patient is ready to be seen, or ready for the next step in the clinical workflow. While the actual patient encounter and computerized physician order entry (CPOE) takes place within electronic health records (EHR) software, many physicians rely on their practice management system for document management. Some practice management systems include support for imaging, either with a radiology information system (RIS) or picture archiving and communications system (PACS) interface. Many systems also include an electronic fax function, allowing offices to go fully paperless. Some practice management systems’ document management capabilities include the ability to generate forms for referral automation, camp or school physical documentation, and more. Following the physician encounter, practice management software streamlines the claims management and billing processes. Most practice management systems can pull encounter information into various templates in order to create a superbill, and most software will also suggest the appropriate ICD codes for the encounter, reducing revenue leakage. Also, in preparation for the ICD-10 mandate, many practice management systems include a function that suggests the appropriate ICD-10 code, based on ICD-9 codes, SNOMED, or other initial inputs. 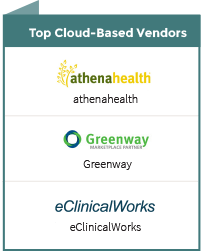 Many vendors also offer fully outsourced billing and revenue cycle management solutions, eliminating the need for coding/billing specialists in smaller physician practices. Which Practice Management software is right for your practice? While typically a function of EHR software, some practice management software includes e-prescribing functionality or built-in integration with pharmacy networks or services like SureScripts. Many PMS even support barcode technology, allowing nurses or providers to scan medications before administering, making sure the patient receives the correct medication and dosage. While billing and claims management are financial functions, many practice management software solutions include robust accounting features like payroll and timesheet management, accounts receivable/payable, journal entry and general ledger, fixed asset management and depreciation, etc. While providers are likely already using email, SMS, or pagers to communicate, HIPAA compliance concerns have led many practice management and electronic medical records vendors to include secure internal messaging or the ability to comment directly on an electronic document. Software that includes this functionality has decreased chances of HIPAA violations due to sharing of sensitive information via an insecure medium such as SMS. Some practice management systems include functions for inventory management, whether that inventory is medications, paper goods, disposable medical equipment, or other tools. Maintaining an inventory record in the software allows for easy forecasting of inventory needs and visibility into stock levels so orders can be placed before supplies are depleted. Some practice management software includes payment features like credit card processing, allowing physicians to electronically accept payment from self-pay patients. While many providers independently maintain backups of their files and medical records, some practice management systems —especially cloud-delivered software— maintain off-site backups of critical files. For larger entities such as hospital chains, some health information systems can function as a data warehouse or business intelligencesystem, allowing structured and unstructured data to be stored and/or analyzed on or off-site. Some practice management software includes a built-in laboratory information system (LIS) or other lab management system that automatically sends orders to various medical laboratories or diagnostics centers, such as optical laboratories, phlebotomy labs, cardiology diagnostics, etc. In addition to choosing which of the above features are needed for a particular office, prospective buyers should consider the following variables before making a decision. 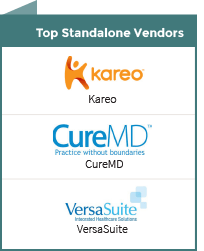 While there is no shortage of standalone options when it comes to practice management systems, many software vendors sell an integrated PMS and EHR software solution. If a provider has not already adopted an EHR, or if he or she is unsatisfied with their existing EHR Software, implementing an integrated solution will cut down on gaps in functionality, interfacing issues, and Meaningful Use attestation difficulties. Also, be aware of the trend in “modular” software design. While intended to allow providers to pick and choose only the functions desired, when dealing with modular systems it is important to check — especially when selecting a modular EHR and a modular PMS from different vendors — that no functions are duplicated or missing. Perhaps one of the biggest decisions to make when choosing a PMS is whether an on-site, server-based solution or a cloud-delivered, Software-as-a-Service solution best fits a provider’s needs. Typically, the up-front costs associated with on-premise solutions are high, but ongoing fiscal requirements are low. The opposite is true with cloud solutions; as a subscription-based service, the up-front costs are usually quite low, but the monthly or yearly fees are typically higher than an on-premise solution. Another issue in the cloud vs. on-premise debate is data access and security. With an on-premise system, as long as an office’s equipment is powered and functioning correctly, providers have access to their data. With a cloud-delivered solution, if the internet connection is lost, access to data is lost. While the Meaningful Use (MU) Incentive Program is designed to encourage the adoption of electronic health records software, many practice management software functions— like patient portals— are included as requirements of a “complete EHR.” If a practice is considering or has already begun the process of attesting for MU, it is important to remember that attestation is fully determined by the software used. It would be ill-advised to switch software between stages of MU attestation, but if it is necessary, be very careful to make sure any new software will allow attestation for the clinical quality measures (CQMs) desired.